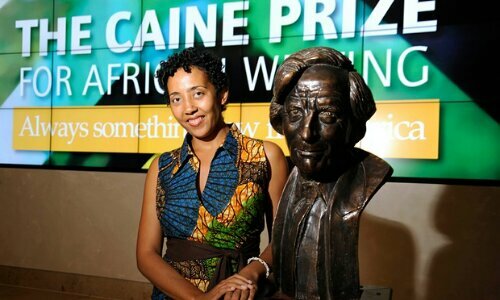 Namwali Serpell has become the first Zambian writer to win the prestigious Caine prize for African writing, for a short story described as “truly luminous” by judges. The £10,000 award, which counts African winners of the Nobel prize for literature Wole Soyinka and JM Coetzee amongst its patrons, is for a short story by an African writer published in English. Serpell , an associate professor of English in the University of California, Berkeley, won for The Sack [which can be downloaded as a PDF here]. The story explores the power struggle between two men, one very ill, and the woman who came between them. Serpell said her story was about two men who had known each other since childhood, how they have gone through “a long process of trying to build a political movement together, which failed, and in the process falling in love with the same woman, who died. It’s about trying to come to terms with that”. “It has multiple inspirations,” she added. “When I was 17 I had a dream about a sack, and I didn’t know if I was on the inside or the outside. I found it very disturbing. The Japanese horror director Takashi Miike’s Audition, which also involves a sack, is another inspiration, and it also draws from an encounter I had with [another student] when I was a graduate student. Winning the prize, she said, didn’t seem real until she managed to tell her family in Zambia. “It was a real honour just to be on the shortlist,” she added. Serpell’s story beat Nigerian writer and former Caine prize winner Segun Afolabi ’s The Folded Leaf, Nigerian Elnathan John ’s Flying, and two South African stories: FT Kola ’s A Party for the Colonel and Masande Ntshanga ’s Space to win the prize. The South African writer Zoë Wicomb, who chaired the judging panel, called it “formally innovative, stylistically stunning, haunting and enigmatic in its effects”, and an “extraordinary story about the aftermath of revolution with its liberatory promises shattered”. “It makes demands on the reader and challenges conventions of the genre. It yields fresh meaning with every reading,” she said. Wicomb was joined on the judging panel by the Booker-shortlisted author Neel Mukherjee, former Caine prizewinner Brian Chikwava, Royal African Society chair and journalist Zeinab Badawi, and Georgetown University assistant professor of English Cóilín Parsons. Serpell, who was named one of the most promising writers for the Africa 39 Anthology, has had a story selected for the Best American Short Stories collection in the past, and was shortlisted for the 2010 Caine prize. She published her first book of literary criticism, Seven Modes of Uncertainty, last year.